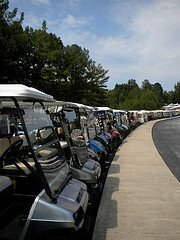 Peachtree City, Georgia is a true golf cart community, with over 100 miles of networked golf cart paths that can take you to grocery stores, restaurants, schools, and neighborhoods. 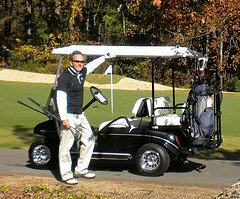 We have lived in Peachtree City for over 20 years and enjoy using our golf cart to get around as much as we do for the golf. 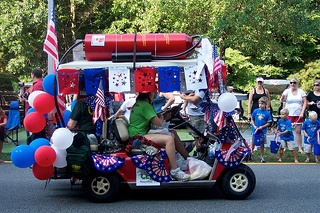 There are many reasons to consider living in a golf cart community. The obvious one, is that you can use the golf cart as your main mode of transportation. This appeals to my wife and I who have had long commutes to work through the city of Atlanta. 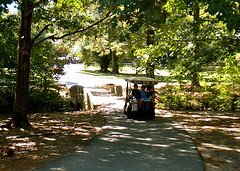 On weekends, we find that hopping on the golf cart and traveling on quiet and beautifully shaded tree lined paths, relaxing and enjoyable. 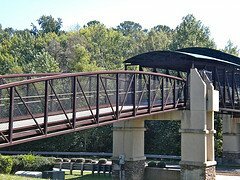 Bridges and tunnels take us over or under busy streets to restaurants, shopping centers, and to friend's houses. 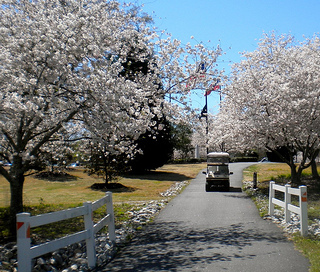 Unlike many other golf cart communities, this is not a retirement community. People of all ages live here. Young families especially enjoy taking their kids to school, to the pool or to the library on the golf cart. However, if you are in your retirement years, this is a great place to live as well - especially if you like golf. Maybe you have become uncomfortable driving due to health or vision problems, but still want the freedom and independence of getting around by yourself, this is a great place to live. Young families, like our daughters, love living in a golf cart community. The kids love riding on a golf cart instead of hopping into a hot car. Take them to neighborhood parks, pre-school, the library, soccer games, or to a friends house all by golf cart path. Parents take their kids to school or pick them up by golf cart. Kids can sit right next to the parent for a chatty ride back home. There's plenty of community spirit - especially during the Fourth of July. With a parade filled with, yes, decorated golf carts, a patriotic show at the Fred (our local amphitheater) and the best fireworks around there's no place we'd rather be on this special holiday. Lest you think this community is for retired seniors, think again. Here is a picture of the golf cart parking at our local high school. Golf carts are a favorite mode of transportation for high schoolers - way cooler than taking a bus or having a parent drive you. 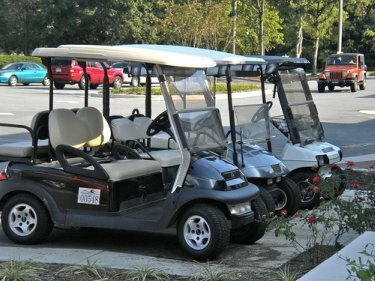 Convenient, special golf cart parking is available at almost all of the local shopping centers. 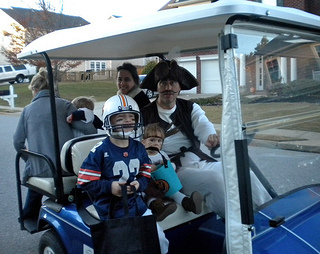 Even Halloween takes on a new twist with streets jammed with golf carts taking kids Trick or Treating. You will find golf carts decorated with spider webs, string lights and more. Registered golf carts cannot exceed 20 mph. Registered LSMVs need to set their speed mode to 20 mph or less. All laws and ordinances that apply to automobiles in regards to alcohol, open container laws or driving under the influence (DUI) apply to golf carts. Carts can only be driven by persons 16 or older with or without a drivers license - unless the license has been suspended or revoked. A 15 year old with a valid learners permit in their possession may drive on the golf cart paths. Those without a learner's permit my drive IF accompanied by someone 18 or older with a valid driver's license. 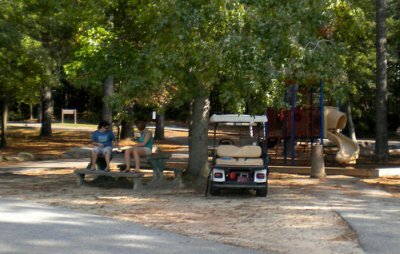 These are just some of the major rules that apply to Peachtree City's golf cart paths. The vast majority of golf carts are electric. While a fully charged battery can take you all over town, there are times when your cart may be low and needs some charging before getting home. The library is one place where public charging outlets are available. Of course you need to remember to bring your charger. 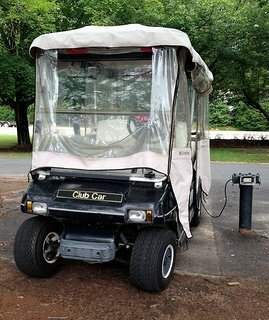 How quickly can an electric golf cart battery recharge? It depends on how old the batteries are, how far the batteries are discharged and how well they've been maintained. It takes several hours to fully charge batteries that are low, but sometimes a person just needs some extra charge to get them home - and in that case - this is a great use for a public charging station. The private golf courses in Peachtree City Georgia are part of the Club Corp.
As a member of Club Corp I can play at any of their 21 golf courses in Georgia. I've played at just about all of them. I love the convenience of being able to play in my own back yard or the opportunity to try a new course. For the rest of the family, the Cannongate membership includes access to tennis courts and classes and to their spectacular swimming pools. All golf carts need to be registered within 10 days of the date of purchase. The information that is required on the registration form is the serial number, the year the cart was made, the make, color and current registration number. 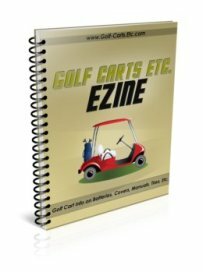 If you are a new owner of an already registered golf cart you must fill out an Ownership Transfer form for which there is a $5 transfer fee. The forms can be found on on line on the Peachtree City website. Forms and payment can be mailed or brought to City Hall, 151 Willowbend Road. If you sell your golf cart you must submit a Release of Ownership form to City Hall to remove your name as the responsible party for the cart. 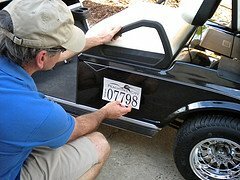 Place your new registration number decal on the side panels below the front seat, on both sides of the cart.